"WRITING ACROSS THE LANDSCAPE : Travel Journals 1960-2010" by Lawrence Ferlinghetti. Best known for his generational classic poem A Coney Island of the Mind, his friendship with writer Allen Ginsberg and his co-founding of the iconic San Fransisco City Lights Booksellers and Publishers, Lawrence Ferlinghetti's travelogues, musings and drawings have been painstakingly published this fall by a division of W.W. Norton in a comely coffee-table volume. Ferlinghetti takes us along on his wide flung travels spread over more than 60 years of his 96 year old life. His panoramic portrait of life across the twentieth century and beginning of the present one from Mexico to Morocco, to Paris and Rome and beyond is a stunning portrait of a life indeed. And what trips he took! For example, in his piece Marrakesh Journal written in 1983, his take on not knowing the language is that voice sounds register on the mind with an "immediate quality of poetry, the quality of pure color in painting, with the percussive effect of pure sound in a void." He is right, of course. Going "unprepared" without having studied anything about a country or its language is a fine way to go. He notes it is only then, we become like "children newly arrived on earth, with vigin timpani, each a tabula rasa upon which all has yet to be written." Included in this book are many of Ferlinghetti's poems, some of which were previously unpublished. Though not as existentially profound as some others', they are almost always readable and thankfully comprehensible. To those uninitiated into Ferlinghetti's confectionary style, this volume may open a world of good reading of his prolific bibliography. Ferlinghetti is also well known as a painter, being represented by George Krevsky Fine Arts in San Fransisco and having had retrospectives in major museums in Rome and elsewhere. Liberally sprinkled though out this tome are whimsical drawings that capture the poetry of the human form artfully -- indeed, knowingly. The sneaky magic of his faces and bodies often illustrate the travelogues' main themes quite aptly. Both his prose and poetry as well as his drawings have similar unmistakable heartbeats. 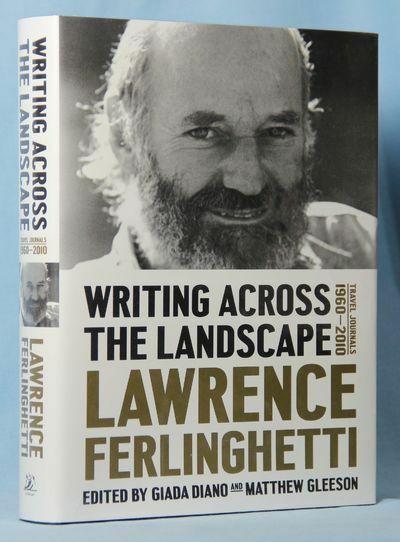 Writing Across the Landscape is not collection of stories from Ferlinghetti's life. This book does serve as a master class on how one of America's best poets takes in the raw input garnered from his observations. In every chapter, he throws out his net and collects this input, and pounds on it until it becomes poetry. This book turns a neon strobe light on Ferlinghetti's travels so one can see anecdotes and images briefly and in a hyper-focused manner. And then at the end of the often too-short chapter, these images and feelings are gone in the wind often without method demonstrated in their madness. He writes mostly in English with splashes of venue-appropriate Spanish, Italian and French. These travel journals give us a small taste of his life as a revolutionary, a poet and an activist- wanderer. However, the reader will not walk away with any deep insight into his life, loves and motivations -- or even of who he is as a person. What this important book does provide is a glimpse of the creaky gears of the inner recesses of the author's mind where poetry is conjured. I'm sure that if these same experiences and places were explained by any other writer there would have been completely different results. I'm also sure that if Ferlinghetti were to get one more pass through life, the results will be completely different the second (or third?) time around. Full of surreal imagery, hopeful, romantic and often despairing commentary, Ferlinghetti's prose is an easier to read version of his poetry. Most of it seems to be written either while he was traveling alone or while intentionally "writing out" any travel companion including Alan Ginsberg. Some of the author's language and cultural references may be a bit dated for younger readers. However each person will likely take away a travel memoir of some particular place and time and likely carry it with him, perhaps stimulated to visit that place personally. Almost everyone who reads this book will find a poem, a passage or a drawing that will stay engraved on her life forever. Just as the work of Lawrence Ferlinghetti will no doubt remain the voice of a great American bard long into the future.